With sparkling beaches, gleaming buildings and parks of all kind, Dubai is a treasure trove of stunning photo-ops and candid captures. Charge your cameras and trek the city to check out these top selfie spots this January. 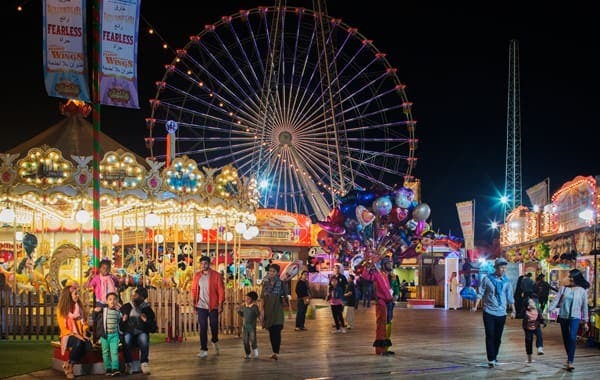 Whether it's Al Seef, La Mer or The Beach, it goes without saying that any of Dubai’s waterfront hotspots are some of the city’s top settings for a good snap. All three are decorated with green palm trees and bright lights, yet have their own individual vibrancy that acts as a natural filter. 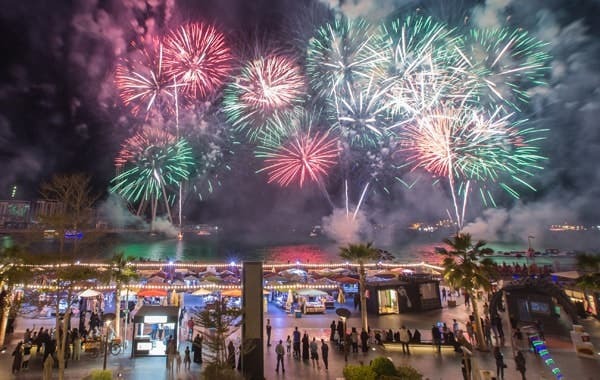 If you’re looking for the ultimate photo-op, these weekends see regularly planned fireworks in celebration of the Dubai Shopping Festival, so find a spot by the water, get your camera ready and wait for the lights to glow overhead. We’ve yet to come across a photograph with the Burj Khalifa towering in the background that isn’t impressive. The Dubai Fountain by The Dubai Mall offer one of the closest views of the skyscraper, but it can be hard getting the perfect shot with the whole building in your frame. 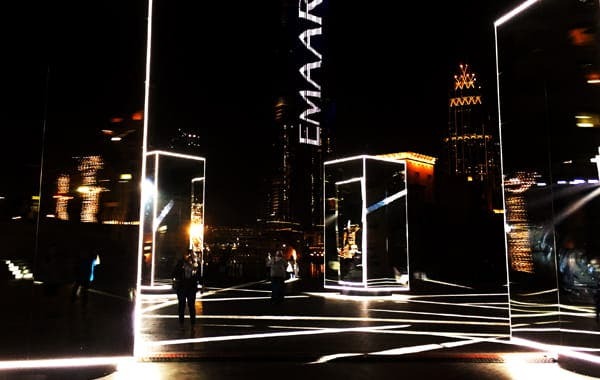 So instead, make your way to Burj Park Plaza – it’s the perfect distance from Burj Khalifa, and you can angle your frame to include a little bit of the stunning Downtown Dubai skyline as well. These days, the area is host to a set of six remarkable mirror-clad structures designed by lighting expert George Tellos that add extra dazzle to the setting. Walk across the bridge from Burj Park Plaza to find yourself at Burj Park itself. The park is coming alive with Market Outside the Box from 25 January until 2 February. 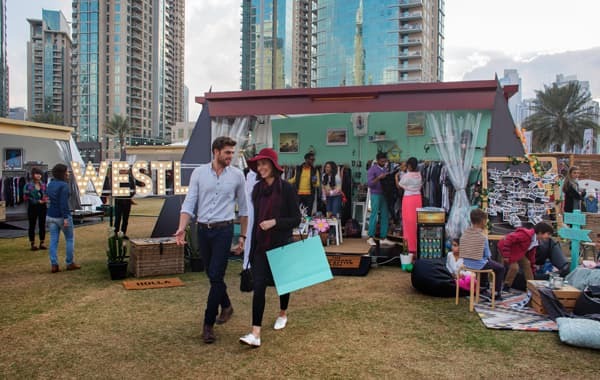 The eclectic outdoor bazaar is an Instagram picture in the making with vibrant stalls, funky food trucks and live entertainment. There are plenty of spots and decorative elements that make for the perfect frame, starring all the dynamism of the scene. The Burj Khalifa might even photobomb a few of your shots. 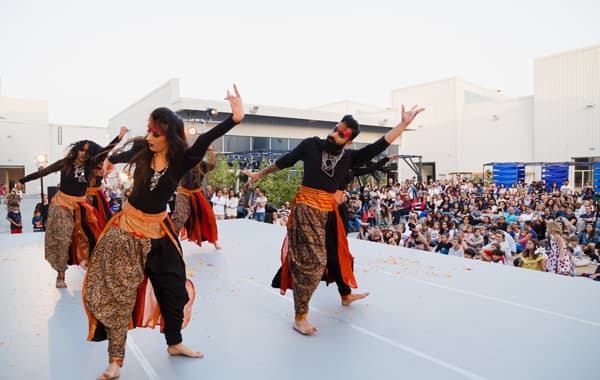 This year’s Global Village goes above and beyond all imagination. Season 23 features a world of brand new attractions that aren’t only a delight to experience, but a joy to capture. Check out the Floating Market for a picture with colourful boats and tuk-tuks selling delicious street food from around the world, or head to the dancing fountain for its incredible fire shows. Even the 60-metre high Wheel of the World, which is accompanied by a 50-metre LED screen, makes for a hard-to-match backdrop. Visit on 25 January, and you can add Egyptian singers Saad El Soghayar and Amina to your star-studded selfie. Alserkal Avenue is located in Al Quoz, an industrial district that plays host to a vibrant art scene. It’s an unusual setting, but that’s part of the district’s charm. The blend of poignant art with a factory feel creates a juxtaposition that acts as a work of art itself. These days, the Quoz Art Fest is lighting up its avenues, but even on a regular day (or night), the district is worth exploring. Try to get Mary Ellen Carroll’s permanent structures above the avenue that read “WHEN WILL YOU ARRIVE” and “WHEN WILL YOU RETURN” in your frame or pose under a canopy of fairy lights hanging over the wide, warehouse-lined paths. The photo-ops here are endless. Downtown Dubai in the day is stunning, but nighttime sheds a transformative light on the neighbourhood. The district’s buildings and streets come alive with lights that set the area aglow, but if you want a spot with a backdrop few spaces can match, it’s The Opera District. Dubai Opera, the prestigious performance venue, is designed in the image of a traditional dhow, with contemporary elements that make for a stunning setting. The area faces The Dubai Mall and Burj Khalifa, so you can even fit those iconic silhouettes in your picture. Dubai’s beaches are matchless and make for a fabulous selfie spot. We may have listed The Beach and La Mer before, but if you’re in search for some unfiltered, bona fide sand and sea views, check out Mercato Beach in Jumeirah for your shot. The beach – with smooth, golden sand and turquoise waters – is seldom overcrowded. Wait for the perfect wave and let nature direct your photoshoot. 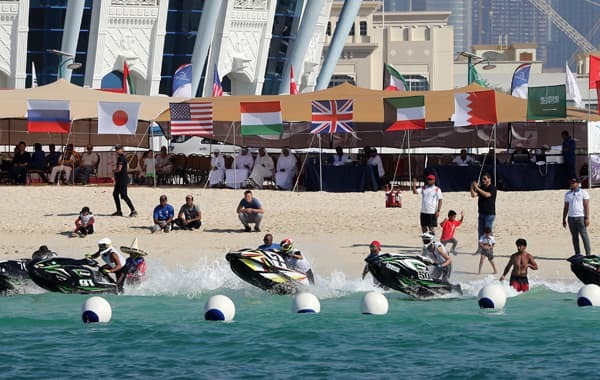 Mercato Beach is also the venue for the UAE Aquabike Championships, which is on until 2 March, so plan ahead and you can also get a shot with the thrilling race in the periphery.